Whew, issue #1 isn't even out yet and we already have ourselves a tiny preview for the second issue, scheduled to hit newsstands in June. “Let the Games Begin!” Part Two: Rock was just a simple helper-robot. Now he’s the world-saving Mega Man! 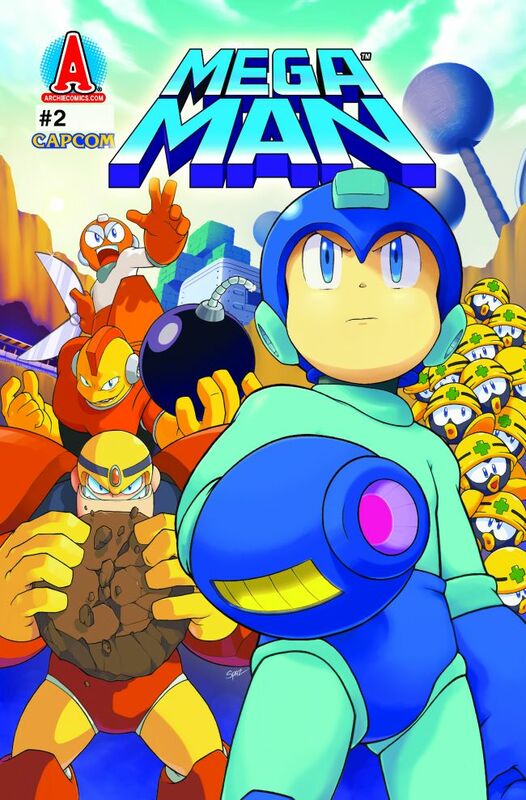 Armed with only his Mega Buster, can Mega Man face down the Robot Masters? More importantly, can he face his own reservations about fighting his own kind? The anticipation is just grueling; can't wait for the comic to come out! As a reminder, issue #1 will release on May 4th, 2011, with new issues arriving once a mont You can purchase a subscription right here. Whoa, there's something funny about Rock's robot ear things. And Bombman needs a dentist. Nice cover. It's good they're giving adequate exposure to the original robot masters. I think they should take a chronological approach. The cartoon plugged them at random, and it felt kinda awkward. The art here is good, reminiscent of the Rockman: Complete Works style. BombMan looks nuts, which really suits him. It reminds me of the Dr.Wily Show. I hope this comic has a nice, long, healthy run before they taint it with crossovers from other Megaman series' (This means you, especially X series) Just say NO to Zero, Archie!.